The famous dental apparatus is necessary to correct the shape and distribution of teeth not only in adolescence but any period of a person’s life. In addition it is something very common, that we can see even in celebrities. The use of these metal parts or brackets may report a number of problems in the mouth that need to be known if we want to avoid them. Here are the most common and how to avoid them. Another of the most common problems that can appear when we use brackets is the bad smell of the mouth. This odor is caused by the food that is embedded between the metal parts or gums of the brackets. What you should do to avoid this nasty smell is to avoid sticky or too small foods, such as noodles and maintain an impeccable dental health: wash your teeth several times a day to be able to be with an electric brush and passes dental floss to remove food leftovers that have been trapped in the appliance. If you also use gums, change them daily. One of the most frequent problems associated with corrective orthodontics is the appearance of wounds on the inside of the lips and cheeks. 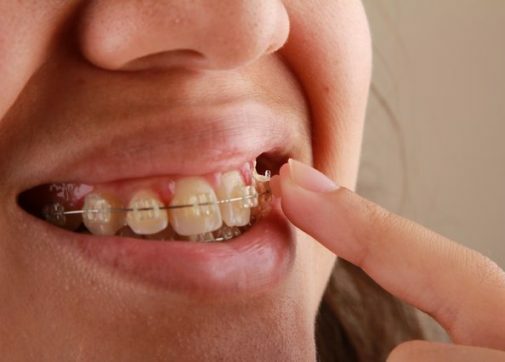 This is very normal because the protruding parts of the brackets constantly rub the inside of the mouth and cause scratches that can be more or less deep. To avoid as far as possible that these appear the best solution is to rinse your mouth with water and salt when the injured appear two or three times a day and avoid eating hard foods. Unfortunately, the pain for brackets during the first few moments until the body gets accustomed to them and to the movements that provoke to align the teeth is almost inevitable. Try to drink or eat cold foods or ice cream during the days when it hurts you because this will greatly calm the pain-numbing the mouth. Also if the pain is very strong you can take mild analgesics that you can buy without prescription at the pharmacy. Regardless of the type of problems you have with your brackets, the most important thing is to face them with philosophy. Thinks it is something that is necessary to be able to have aligned and beautiful teeth in the future and also, will avoid many problems associated with the mouth in the future. So, keep patience and take it in the best possible way.